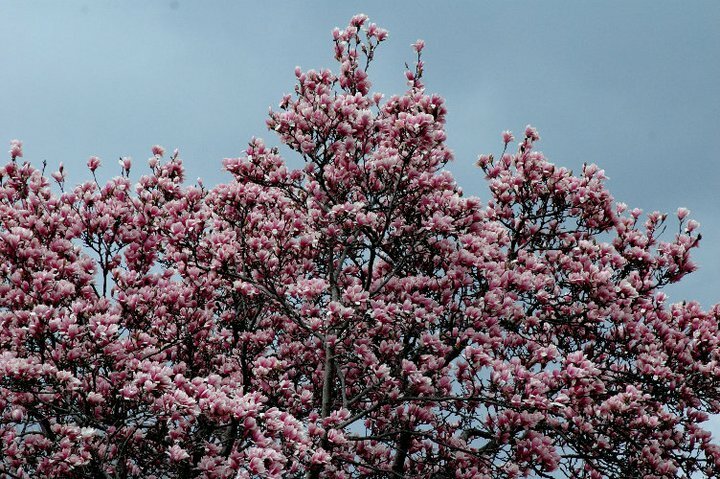 The redbud tree in my yard. Anyway, without that particular thought consciously on my mind, I knew I wasn’t up for a planned workout on Monday afternoon. I came out of my office to a pretty substantial rain shower, it had been a long day, and I didn’t feel like doing much of anything. The dogwood trees are in full bloom. When the rain started to let up, I had a decision to make. Go work out, or go do something else. 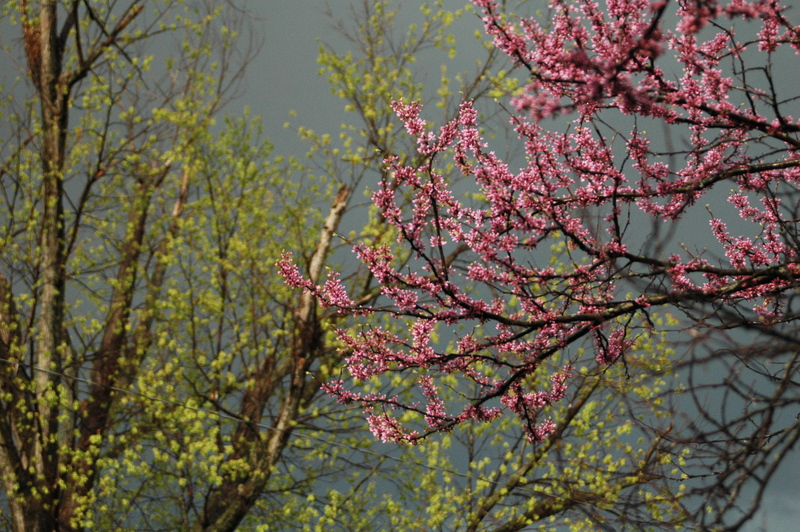 I noticed the sun shining through the wet trees, so I grabbed my camera to snap a couple of pictures of the redbud tree in my yard. It was about that time that I heard an owl hooting. I’ve been trying to get owl photos for a couple of years now, and I’ve only managed to get one on film, so that hooting was enough for me. I decided I would go on a bike ride and look for owls to photograph. I holstered my camera in a small ripstop nylon backpack, put on my bike shoes and hit the road. The streets were wet and my tires were loud if I was moving too fast, so I rode slowly trying to locate the hooter. The one picture I have taken of an owl! 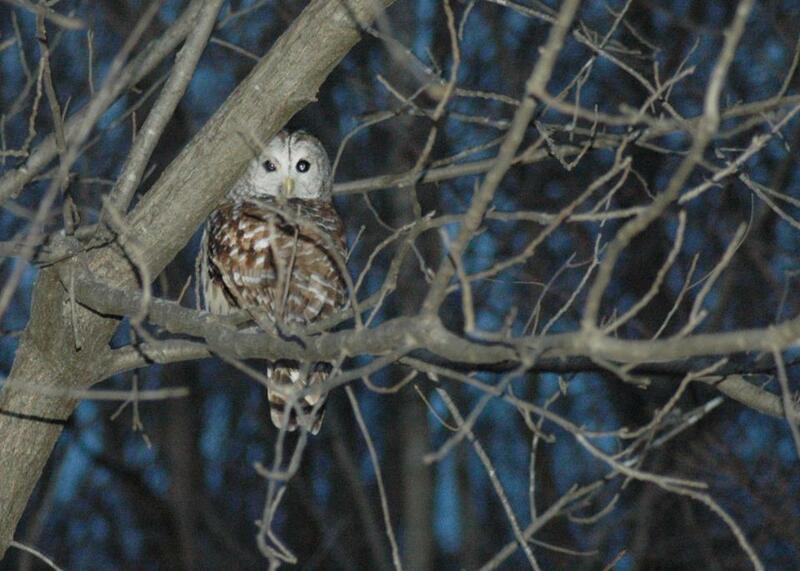 This Barred Owl was hanging out near Warsaw, IL. Ears perked like my cat hunting a mouse, I rode through my neighborhood, sure that I was close to my prey. The familiar “who-cooks-for-you” hoot pattern of the owl let me know that I was looking for a Barred Owl, and that he might be closer to the ground than if he were a Great Horned or Screech Owl. I caught the sound of some cardinals in a dogwood tree before I saw them; it seems like rain always gets the redbirds going. A little further down the road, I spied the orange breast of a robin splashing about in a puddle; he was chirping and had clearly enjoyed the early spring shower. The first owl had apparently had enough hooting and was now off my radar, but owl calls carry, and when I heard another in the distance, my hunch was that he might be hanging out in a nearby cemetery. It’s hard to hear the low calls of an owl over traffic, so I was listening very closely to everything around me, and suddenly, I found myself immersed in the sounds of riding through town. I passed a house where someone was practicing piano and playing a jazzy riff over and over with the emphasis changed and a note missed here and there. I heard grackles and finches carrying on. I listened to car tires on wet streets, and noticed the different sound of my own bike tires on the road. I rode near TCBY and heard the melodic laughter of children who were sitting eating frozen yogurt, and some twittering directed my attention to some enterprising house sparrows who were picking up bits of cone that had been dropped. When the breeze blew, the trees shook and dropped big heavy drops of water that splashed loudly on the sidewalk. 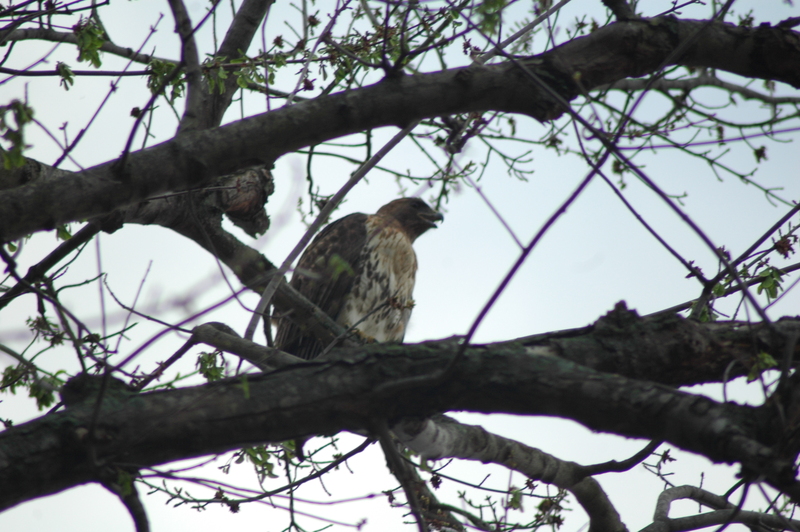 This red tailed hawk was kind of a talker! The whole of the ride became a journey in sound, and I experienced my town in a brand new way. I entertained every noise that came my way whether it was the alarming sound of an ambulance, or the familiar bark of my neighbor’s dog, or the sounds of all the little birds that made their home in the city. I chased the sounds of owls south and was briefly very excited to spot a large bird silhouette high in a tree, only to find that it was a red-tailed hawk hunting field mice in a small open space behind the park. I hopped off my bike and snapped a few photos of the hawk, and he croaked an annoyed message at me that said I’d blown his cover and he’d rather I found something else to do before he flew off to another tree. The one thing I didn’t do on my ride is turn on my bike computer. I don’t know how far I went or how fast I was riding. I don’t have a maximum or average speed to report from my trip. I can’t tell you the route I took because I didn’t map it. I just rode around and, for the first time in a long time, listened to all of the sounds of Quincy. It’s nice to have no particular place to go.